1 What is the Walstad Method? 11 Who is Diana Walstad? 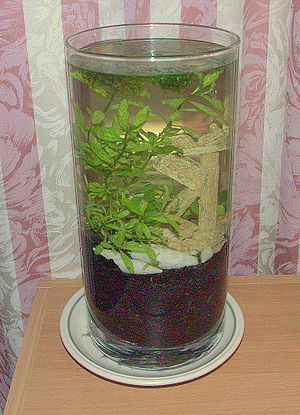 This method of setting up an aquarium tank was made popular by Diana Walstad, author of the book 'ECOLOGY of the PLANTED AQUARIUM - A Practical Manual and Scientific Treatise for the Home Aquarist'. Basically it's a natural planted tank with a substrate containing a soil underlayer. El Natural, NPT (Natural Planted Tank), Walstad Tank. Provide an ecosystem where plants and fish balance each other's needs. The soil underlayer ensures that plants grow well enough to out-compete algae and recycle fish waste and toxins (e.g., ammonia, nitrite, etc.). Without soil, plants don't grow well enough to do "their job". Biofilter may not be required (plants will take care of the ammonia, nitrite and nitrate, and the soil bacteria will also consume nitrogen). 1 inch layer of inexpensive, generic potting soil (or "top soil") available from any garden centres or various home improvement stores. (John Innes number 3 recipe is ideal). Avoid soils containing chemical fertilizers (sulphates and nitrates will be converted to toxic H2S and nitrite after soil is submerged). Phosphate and calcium fertilizers (i.e., a little bone meal mixed with soil) may be beneficial. Get non-sterile 'aquatic pond soil' if it's available. If you have soft-water, you can mix in a calcium source (lime, coral gravel, shells, bone meal, etc) with the soil to make sure plants get enough calcium, GH for their initial set-up. For tank set-up, start out with many species of fast-growing plants (you want to find the ones that adapt best to your tank's conditions). Examples: Hygrophila corymbosa, Shinnersia riv., Rotala rotundifolia, Ludwigia repens, Limnophila sessiliflora, Hornwort, Riccia, etc. Provide adequate lighting. This should be at least 2W per US Gallon (3.8L) of fluorescent lighting over the length of the tank for a period of at least 10 hours a day. 'Cool white' tubes are usually all that is required. If you can position the tank so that it can get a little sunlight for at least an hour a day, then do so (make sure water doesn't overheat). Diana recommends a mid-day siesta , and uses a 5 hour on, 4 hours off, 5 hours on photoperiod on her own tanks. The dark period allows CO2 levels to rise which promotes plant growth and inhibits algae growth. Add room temperature conditioned (no chlorine or chloramine) water. Or add water conditioner before putting it in the tank. Provide enough water movement (via filters, power-heads, etc) to keep the water safely oxygenated for fish and soil bacteria. (Keeping water safely oxygenated is especially important the first two months with a freshly submerged soil). Water circulation near the water surface will break up possible bio-film development. Test water every two days for pH, ammonia, nitrite and nitrate (for at least two months or until you are sure they have gone). There may be a temporary increase in these levels while the soil is getting established (first 2 months), especially if the soil was artificially fertilized. Consider the use of Prime or Amquel daily to remove any potential total ammonia that may develop in the initial two months. If there are signs of algae, temporarily reduce lighting levels slightly or add floating plants. Main goal is to get plants growing well enough to out-compete algae. Do water changes as needed [some soils often require frequent water changes the first two months to remove miscellaneous toxins (e.g., wood oils) released by the soil. Also, new soils invariably release algae-stimulating nutrients (Nitrogen) the first couple months.] 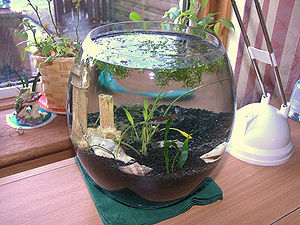 After tank is established, water changes can be very infrequent. You should wait at least two months while water parameters are established before adding aquatic animals; however, simple algae-controlling organisms such as feeder shrimp ("wild shrimp") can be added prior to that point. It may be necessary (though unusual) during this "soil break-in period" to do some water changes to lower tannins. Some people use activated carbon in the filter if you wish to remove any yellow tannin effect (but realise these tannins are a health benefit to the tank animals. Monitor ammonia/nitrite levels for the first month. If you get any level above zero, act on them - perform a 25% water change! However if you add Prime or AmQuel+ daily for a month, you'll protect the tank occupants against any possible harm from ammonia/nitrite and eliminate this chore. Soil naturally contains nitrifying bacteria that will process and detoxify ammonia and nitrite. It also contains denitrifying bacteria that will process and remove nitrates. Plants will consume ammonia and nitrite, which they prefer to nitrates. The soil will release Carbonates (C03-) into the water that will greatly stimulate plant growth and stabilise KH. No Old Tank Syndrome. Fish waste (Mulm) and uneaten fish food will be quickly converted by soil bacteria into its component chemical parts so that plants can use them for their nutritional needs. Substrate with a soil under-layer should last many years (~10 years), because fish and plant waste will continuously replenish the nutrients that plants extract from the soil. No need to add fertilisers for years. The substrate releases trace elements that fish require for health therefore reduces need for water changes for this reason. Trim the plants back as required and adjust the amount of light on the tank for fine tuning. More light, more plant growth, less algae. Consider adding small snails as these speed up the mulm breakdown. But not essential. You'll need a water hardness (GH) of greater than 7d. To raise GH you can add coral gravel or clean sea shells and let them slowly dissolve. However, adding a 4:1 mixture of calcium chloride and magnesium sulphate is one way to get the GH up immediately without increasing the pH. KH should never drop below 6°d with a Walstad tank, the bacteria in the soil generates natural KH. Add slower growing plants like Hydrocotyle verticillata and Anubias once the fast-growing plants are established. Test your nitrate levels monthly (or sooner after adding fish) to ensure that nitrate levels are not rising too high (ie > 50 mg/l). If it does, you've probably got too many fish, or are feeding them too much. Replace the lighting tubes every 9–12 months (compact fluorescent lights can go on considerably longer). Avoid disturbing the gravel during water changes, etc. One can place a dish or other flat object on the gravel to keep water additions from disturbing the soil layer. Fish load depends on plant growth, tank's surface area, and water movement/aeration. Tanks with more fish provide plants with more nutrients and CO2. Conversely, tanks with robust plant growth can hold more fish. Often, the limiting factor is water oxygenation. For example, one can increase the fish load by simply increasing water movement and water oxygenation. If you wish to increase the number of fish in the tank (or you've added too many), add a normal biological filter. This will supplement the nitrification process performed by the soil. Diana Walstad has recommended the garden soil 'Scotts Lawn Care - Miracle Grow Organic Choice Potting Soil' as sold in USA and UK. USA - Scotts Lawn Care - Hyponex Potting Soil. USA - Scotts Lawn Care - Miracle Grow Potting Soil. USA - Scotts Lawn Care - Miracle Grow Organic Choice Potting Soil. UK - Miracle-Gro - Organic Choice All Purpose Peat Free Compost. UK - J. Arthur Bower's - Aquatic Compost. 'Scotts Lawn Care Miracle Grow' is known as 'Scotts Miracle-Gro' in the UK. Tip - look for soil marked as having a pH of ~6.0-7.0 if possible. Test the soil pH or ask the manufacturer if necessary. Avoid heavy manure-based soils. Avoid 'Ericaceous Compost' as it may be too acidic. Try not to use soil with peat in it as it may be too acidic. Try not to use soil with wood shaving as it may cause more organic breakdown and lots of tannins being released. 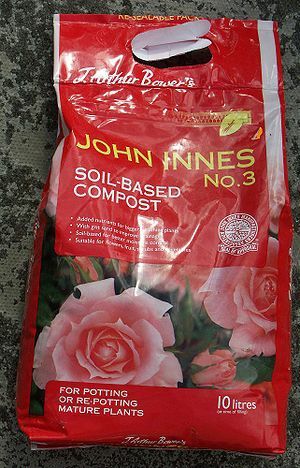 The name 'John Innes' is actually a recipe for soil. See John Innes Manufacturers' Association for more info. Diana lives in North Carolina, USA and is technical advisor for the AGA (Aquatic Gardeners Association). See also MS - Mineralised soil. This page was last edited on 11 February 2019, at 22:40.